Gurgaon-based Green House Ventures Accelerator, launched by Vikram Upadhyaya, a serial entrepreneur and member of Indian Angel Network, has invested $100,000 (around Rs 6.7 million) each in two startups â€“ Applop and CaRPM. GHV Accelerator will provide the two startups the necessary infrastructure and support to achieve their next level of growth. GHV Accelerator plans to on-board 10 startups by 2016 and bring this number to 25 by 2017. Launched in July 2015, Applop is a mobile app which enables smartphone users to create and customise their mobile apps without the help of any coding. Applop has helped create more than 600 apps till date for its users and more than 50 per cent of its users are paid customers. "They have a great team with great execution capabilities and there is also a good amount of technology involved in their products. Their business model is also asset light and highly scaleable," Vikram Upadhyaya, chief mentor and accelerator evangelist, GHV Accelerator told Techcircle.in. "GHV's controlled environment is highly networked and has experienced mentors," said Rahul Singhal, founder CEO, Applop Mobile Solutions Pvt Ltd. 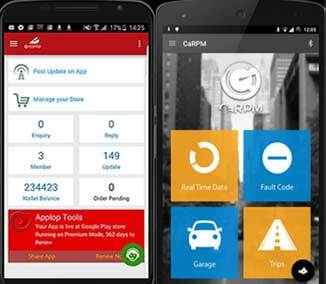 Launched in 2015 by IIT Guwahati graduates Abhishek Maitreyi, Ankit Yadav, Lovish Choudhary and Jeevan Rathod, caRPM is a mobile app which connects with the ECU(engine control unit) of a car and analyses a host of parameters that govern the health and safety of a car. CaRPM helps in analysing the driving pattern, engine health, fuel expenses besides a host of other features. A user can also compare prices, get information on servicing duration and service quality before choosing a service centre through the app. An OBD2 (on board diagnostics) bluetooth scanner acts as the connecting interface between the app and the car's ECU and displays the analysed data from the car's ECU. "The connected car industry is still at a nascent stage and there's huge scope for innovation here. While the automobile industry is generally slow moving, an increase in the use of electronics in our vehicles is altering the user experience rapidly. Our cars are already a lot smarter than what they were in the past decade," said Abhishek Maitreyi, founder and CEO of Zymbia Interactive Technologies Pvt Ltd, which runs CaRPM. GHV Accelerator mentors startups along with a $100,000 seed fund. It has previously several seed-funded ventures including LazyLad, My Taxi India, Foodport Food Solutions Pvt Ltd, a Delhi based food tech startup, New Delhi-based PML Solutions Pvt Ltd which runs online laundry services PickMyLaundry and New Delhi-based Pasta Lifestyle Solutions Pvt Ltd, which operates FitMeIn, an online platform that provides access to multiple fitness studios for a monthly membership fee. In July, LazyLad raised $500,000 (Rs 3.18 crore) in its pre-Series A round of funding from Tekton Ventures' founder and managing partner Jai Choi, Japan-based Sugashita Partners' Kiyohiro Sugashita, and Japanese venture capitalist Hirokazu who have invested in their individual capacities. In July, My Taxi India (MTI) Pvt Ltd, which operates online car rental platform MytaxiIndia raised $500,000 in pre-Series A funding from Japan's largest taxi company Nihon Kotsu Co.
Last December, GHV had partnered with online deal-making platform LetsVenture. It also has tie-ups with Japanese VC fund World Innovation Lab (WiL) and Nasscom's '10,000 Startups' programme to help Indian startups go global after graduating from their accelerator programme.